Puppet Master is one of the longest-running horror franchises of all time, but you never really see it mentioned along the likes of A Nightmare on Elm Street or Friday the 13th. Yet it still has a cult following; it has spawned action figures, replicas, trading cards, comics, Halloween costumes and so much more. While there was a time when it was among the rarest of horror franchises, now you can find the Puppet Master films at your local Family Dollar and even the supermarket. That was absolutely not the case when I discovered the series. Like almost everyone in my age bracket, I discovered Puppet Master—and by extension Full Moon—in the video store. But I could not go out and simply buy them on VHS, even though as quickly as I took to the series, that was all I wanted to do. They just weren’t available and wouldn’t be for years until Full Moon reclaimed the rights to those first movies from Paramount. There was something about the original Puppet Master that immediately resonated with me as a child watching it for the first time. These killer puppets weren’t just weapons, they were characters with their own individual quirks and personalities. Some were meaner than others, some just did what they were told, some liked to get their hands dirty, some didn’t. There was also a larger story at work here that piqued my interest, much in the same way it did when I saw Hellraiser for the first time in that I wanted to know how this story unfolded and how it evolved. The first Puppet Master raises so many questions. Why did the puppet master kill himself, why were the puppets so benign with him, but lethal in the hands of someone else? It’s a story with more layers and integrity than it gets credit for, even if not all of the questions that are raised within the movies ever get answered—at least not by the movies themselves. 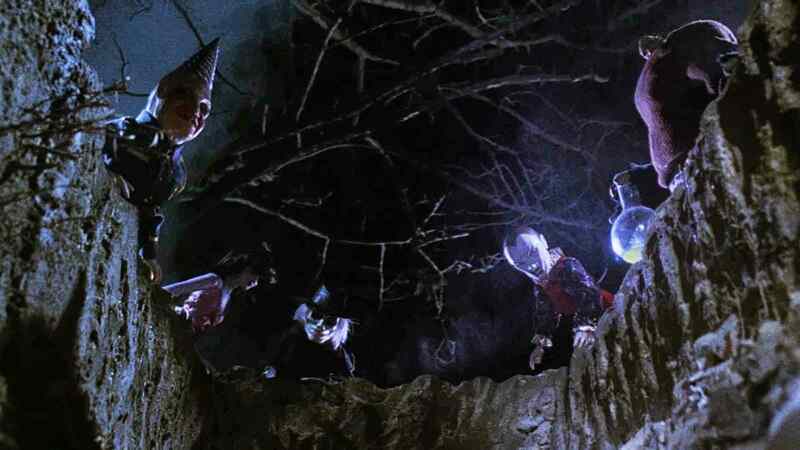 Quirky as it is, as much as its cheesiness shows, there’s something kind of Hitchcockian about the first Puppet Master. There’s a sense of mystery in the fact that you know someone is controlling the puppets, making them kill off the people in the hotel and it could be anyone. Puppet Master was the first from Charlie Band’s Full Moon Entertainment, which was his video company launched after the demise of his previous production company, Empire Pictures. It was a gamble. Puppet Master wasn’t made for much less than any of the Empire films, which had been theatrical releases. Making something for almost the same cost but no theatrical return, they could have just shot themselves in the foot by releasing it on video. But this was the height of the DTV era. When the feature was released into video stores in October of 1989, it was an immediate surprise success. It made a sequel an inevitability. 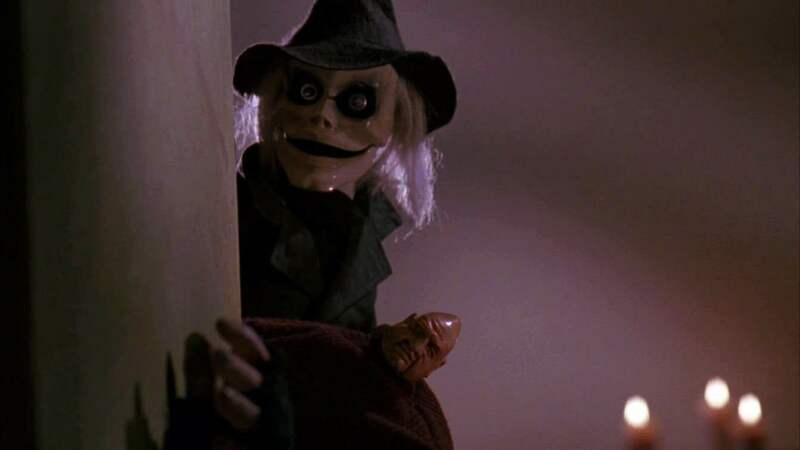 Puppet Master II went into production only a few months later, directed by David Allen, who was responsible for the original’s amazing stop-motion puppet sequences. From a horror fan perspective, Puppet Master II is probably the most accessible of the entire franchise. It has some of the best kills, which are balanced out through the entire feature as opposed to the original, which is focused more on character setup for the first 40 minutes. There’s a real sense of atmosphere and dread at work in the movie. It has clear influences from both the Universal classic horrors—puppet master Andre Toulon’s resurrected appearance is based on the Invisible Man—and the Italian gore classics of Lucio Fulci as well. Simply taken as a horror film, Puppet Master II probably works the best of the bunch. It introduced the fan favorite puppet, Torch, who has not appeared in many entries since simply because it’s too costly to bring the diminutive flame-throwing menace to life. Puppet Master II was immediately followed up by Puppet Master III: Toulon’s Revenge, which is easily the best of the entire series. It’s a prequel set during World War II that gives us all the backstory we need to contextualize the entire mythology—although it is far from the last prequel we would get. Guy Rolfe gives a completely genuine performance as Andre Toulon, a man content with his puppet show and the laughter of children. But when his show takes its political humor too far, the Nazis come to shut it down and kill his wife in the process. And, of course, they’re after the formula that brings his puppets to life as well. Puppet Master III drops the reveal that the puppets were all at one point friends of Andre Toulon who were killed by the Nazis. They were human beings granted life after death in wooden bodies. It changed everything and turned the fun, cheesy franchise into something surprisingly poignant. Of course, everything went as far back in the direction of absolute cheesiness and camp by the time Puppet Master 4 & 5 came along. From Leatherface: The Texas Chainsaw Massacre III and Pumpkinhead II director Jeff Burr, Puppet Master 4 & 5 were actually shot back to back in order to save money. It made perfect sense, though, considering how quickly they were coming out at the time. Both of these features gained a mixed reaction from fans, given that they went in an extremely different direction, turning the puppets into full-blown heroes who now protect their new puppet master from diminutive demons known as Totems. They may have a different look and feel, but 4 & 5 are extremely fun nonetheless. The stop-motion effects are better than ever. They’re not as bloody or focused on the kill count, in fact, they’re basically kids movies. But this was also the time Full Moon was having success with their family label, Moonbeam, which was responsible for the Prehysteria series and Dragonworld, among others. These two Puppet Master entries feel almost more at home among titles like that than the general Full Moon roster. The first five Puppet Master films are a surprisingly strong series that actually tell one overall story, more or less, from beginning to end. Each one expands on ideas presented in the last, which is a rarity among even the best of franchises. These five features were also made in a remarkably short span of time, with the fifth coming out just before the split between Paramount and Full Moon that would change everything. But it’s not just the loss of studio financing and general budget concerns to blame for everything that followed after Puppet Master 5. The series also took a loss when David Allen, who had handled the effects for all of the features in the Paramount era, died after a battle with cancer in 1999. Yet the financial loss was nothing small, when Puppet Master returned after a 4-year gap in 1998 with Curse of the Puppet Master–a quick, hollow production that had very little of the fun and charm presented in the first five features of the series. It’s almost a shot-for-shot remake of the ‘70’s movie Ssssssss and when the puppets needed to do anything more complex than the most basic movement, a shot was simply lifted from an earlier entry in the franchise. While Full Moon’s heart remains in the right place, things have only limped on from there. Retro Puppet Master didn’t have the money to follow up its interesting ideas and was kind of an unneeded prequel after III. The Legacy was a clipshow comprised almost entirely of stock footage. Puppet Master vs. Demonic Toys was a made-for-SyFy movie that Full Moon took no part in and disowns outright. The latest entries, Puppet Master: Axis of Evil and Puppet Master: Axis Rising have been sincere attempts to try and recapture some of the magic of the original, for less money than nearly any of the previous features were made for. Full Moon is still going strong, in some ways, with projects like Evil Bong and Gingerdead Man, made to cater to the Z-grade budgets they can afford. And in truth, I’ll always support them and I never want the company or the franchise to really go away. While I expect almost nothing out of the next entry, I’ll be picking it up the day it comes out. Because this series meant something to me in the old days. In all honesty, it still does. And while that magic is at least recaptured in the comic series—of all things—you always hope for your favorite film franchises to get back on track someday. From 1989 to 1994, Puppet Master was a pretty strong if not sometimes goofy franchise. It was a solid series for a very short time, but will always have a place in my heart, even so. Full Moon has certainly restructured itself to cater to the Internet in a way that seems to be working, but it took a financial hit that had a devastating, lasting effect. But all it takes is for someone to come along with the right story, or maybe the right distributor to partner with Band for a little more money, and the magic could start all over again. In this industry, you really never know what might happen. And if the Puppet Master series proves one thing, it’s that anything can find a second life.